And of course, you need sopare in the latest version. Before we start the training, it’s a good time to check and adjust the mic input. As I’m working most of the time with a headless Pi, „alsamixer“ is my preferred tool. Just make sure that the input is not too high and not too low. I get good results with mic input levels around the 2/3 mark when the mic input level is not yet in the red sector (see the video for a visual reference). and adjust the config setting accordingly. You should test if your trained command is recognized. Normally you should get quite far with the default settings. Short one word commands will result in false positives with the default settings. How to gain more precision is something for one of the next posts as this topic is quite complex and requires some more background which does not fit in this basic usage post. 23. April 2017 24. April 2017 by bishoph	| Categories: Raspberry Pi, voice recognition | Tags: raspberry pi, SoPaRe, speech recognition, voice control | Bookmark the permalink. thanks a lot for this post and also the video tutorial. Very much appreciated as I am looking for a solution to voice control my home automation system. Everything works now according to your great instructions, however the precision of the word recognition could be better. Sometimes, completely unrelated words are detected as a key word. I think thats what you call false positive. Would very much appreciate some hints or another great tutorial! Hi Frank, you are welcome and cool that it works so far. In terms of precision and better recognition I guess I just need to step up and explain how this works 😉 All I can say right now is that it’s all about configuration…and the video tutorial would be really helpful to explain that. Please be patient until my priorities allow me to provide a new blog post and the corresponding video tutorial. Well I am eagerly waiting for your tutorial then. Would really appreciate those tips, I’m hitting kind of a ceiling here. Also: How do you make sure that commands are recognised from different positions in the room? I have the issue that the command which was recorded directly next to the Mic, gets also only recognised next to the Mic. 8) Copy the sopare print plugin and write your very own h-bridge l29 plugin by checking for the command and then turn the GPIO pins low/high according to the action. I recommend to add some timeout logic. It would be great,if you explain how to control RPI.GPIO with the keyword train. How can I run a bash command like „pilight-send -p elro_800_switch -s 21 -u 1 –on“ instead of changing GPIO states? I’ve just started testing with Sopare as I am searching for a solution for a offline speech recognition for home automation. first it seems that you need to clean up your alsa.conf file to avoid the warnings. In regards to the PyAudio issue „Errno -9981“: you can just ignore the warning. Lots of Raspberry Pi users around the world are facing this issue and it has no to minimal impact when using SOPARE. The warning means that your system is not able to keep up with the recording. what’s a „stream read error [Errno -9988] Stream closed“? in the latest testing branch I’ve added a sound test. Could you please use the latest version (>= 1.3.8) and post the output as you should get either recommendations for your sound environment or at least some additional information to figure out whats going on. In my test with different microphones the above error often comes from a „wrong“ sample rate. first of all thanks a lot for your effort here on this project. I really appreciate this. I’m still trying to get it to work, since I’m having the same issues as the guy above. Here’s the output of the testing branch. testing different SAMPLE_RATEs … this may take a while! testing different CHUNK sizes … this may take a while! Excellent. Got all 5000 chunks. Excellent. Got all 10000 chunks. Excellent. Got all 20000 chunks. Excellent. Got all 40000 chunks. Excellent. Got all 80000 chunks. I’ll fix the settings now and give you guys an update later on. Ok. I commented out now the priorization of the usb card. Im getting now different results with the audio test. I set the values to the config file and tried it again. Sadly I stll get the same output as before. [ 1782.131896] usb 1-1.5: Manufacturer: C-Media Electronics Inc.
Realy would like to get this to work. If you need any additional info please do not hesitate and ask for it. I’ll provide them asap. The default points to „hw:0,0“ AFAIR. Your arecord command was executed with „hw:1,0“ which means SOPARE uses a different interface/hardware. From the distance I would say that you need to set the default to „hw:1,0“ but what I don’t understand is the fact that the audio test seems to work and SOPARE does not and that’s why I can’t give you clear instructions, it’s illogical or some information are missing. the issue is that sopare tries to use card 0. Actually there is no card 0 anymore in my system since I blacklisted the onboard bcm2835. output of arecord and aplay is now fine, even the recording works like a charme with the usb device. Btw. I forget to tell you what OS is running and some other facts. If you maybe need the audio card for testing, I would be pleased to send you one or give you a donation. I don’t think so. Since it’s a fresh plain installation of Raspbian Stretch. Nothing has been changed. Just the packets were updated as usual when you setup a new system. Also the tools like 433Utils, raspberry-pi-remote and wiringPi have absolutelly no impact on the audio configuration. In spite of that I tested the link you gave me with exactly the same result as before. Has this been tested with Raspbian Stretch before? I replaced the Model B+ with a RPi2 Model B and used the same SD-Card as in the B+. But I'm sure I'll have other questions soon. 😉 I also document the steps I'm doing for others who want to do the same. That explains a lot. As written in the readme: „SOPARE…requires a multi core processor architecture“ and the Model B simple does not match this requirement 😉 – I must admit that the error messages are pretty unrelated and misleading. If possible I’ll add an architecture test to the current audio test case. hi i’m doing a project using rpi3 that would detect sounds from motorcycle. can I used SOPARE for my project? please help..
Erst einmal wirklich ein sehr cooles Projekt. 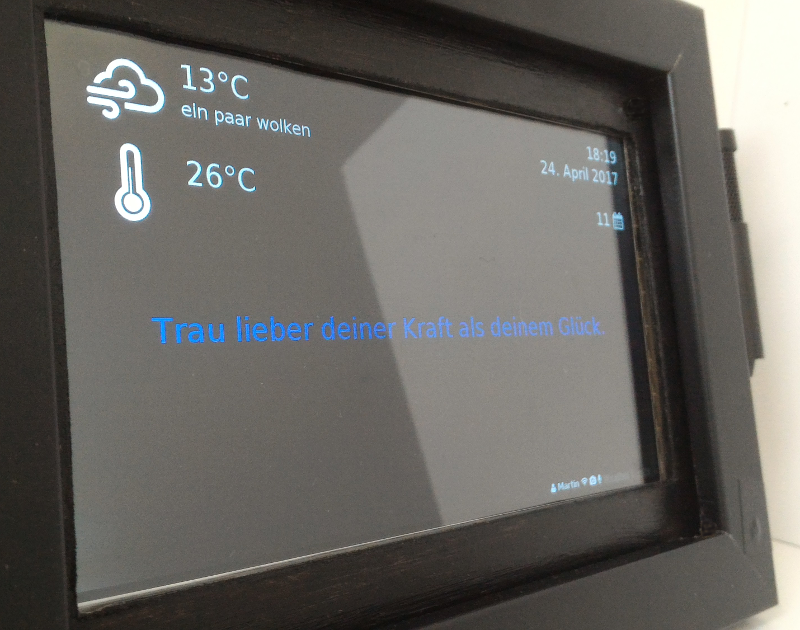 könntest du noch die init vom smart mirror projekt und denn smart mirror code verlinken ? I experienced with copare on raspberri pi 3 b . Everything went well. will this work for orang pi pc plus ? I tried the orange pi ps plus. with an external sound card everything works. speed up. not on all firmware works. Hi! Thanks for the software! Can I train using previously recorded files? How do I do that? I have .wav files I’d like to use for training. Can I use .wav files for testing to? Instead of live mic. Hi, I want to use SOPARE for a robot to identify when a bird sing on a plantation. Do you know if I can use SOPARE in this project? Is there a microphone that can pick up sound at longer distances?